League One side AFC Wimbledon have signed winger Dylan Connolly from Irish side Dundalk for an undisclosed fee. The 23-year-old, a Republic of Ireland under-21 international, is Wally Downes’ first signing as Dons boss. 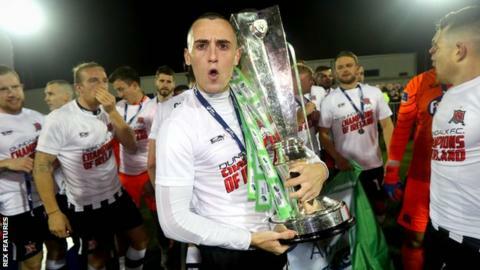 Connolly scored eight goals in 51 appearances in all competitions for Dundalk after joining from Bray Wanderers in the summer of 2017. He has previously had spells at Bohemians, Home Farm and Shelbourne and Ipswich Town. “Dylan epitomises what I think the club has been founded on – an appetite for success through hard work and endeavour,” Downes told the club website. The south west London club have not disclosed the length of his contract at Kingsmeadow.